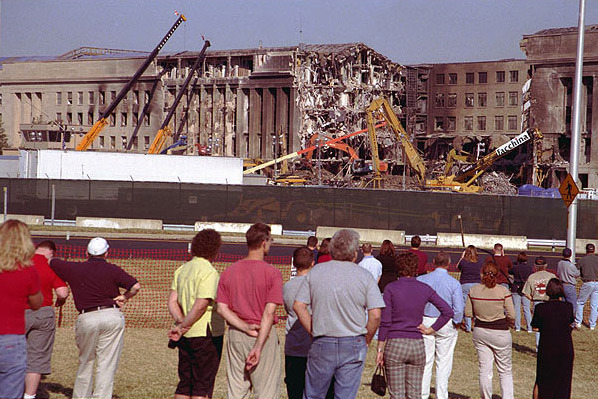 Two and a half weeks after the terrorist attacks on the United States, people still come to watch the construction crews work on removing the debris at the crash site at the Pentagon. If you look behind the cranes, you can see the hole where American Airlines Flight 77 crashed through the building. September 28, 2001 - Two and a half weeks after the terrorist attacks on the United States, people still come to watch the construction crews work on removing the debris at the crash site at the Pentagon. If you look behind the cranes, you can see the hole where American Airlines Flight 77 crashed through the building.